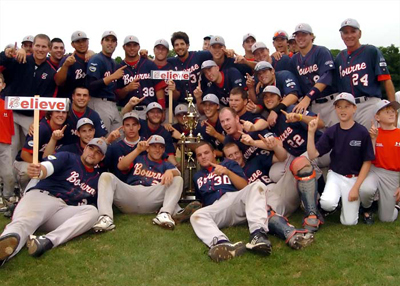 COTUIT, Mass.—It took the town 44 years—longer than the Braves themselves have existed—but the Bourne Braves have won it all. They swept Cotuit with a 5-1 win at Lowell Park to win the Arnold Mycock trophy and claim a place among the other nine teams in the league as champions. with the Arnold Mycock CCBL 2009 Championship trophy. “Last year, we told Harwich it had been a long 21 years. I can only imagine how 44 years felt,” said Commissioner Paul Galop as he handed the trophy to manager Harvey Shapiro. For the Braves, who became a team in 1988, the moment was perfect. Cotuit got the first run on the board with a Zach Maggard (Florida Southern) double that scored Kevin Keyes (Texas) in the bottom of the second, but they didn’t hold the lead for very long. Bourne put up three runs in the third and kept the lead for the rest of the game. Pierre LePage (Connecticut) hit a two run single early in the third to bring home teammates Chris Wallace (Houston) and Zack MacPhee (Arizona St.). Then, with runners at the corners, Kyle Roller (East Carolina) took a strike, LePage stole second, and Scott Woodward (Coastal Carolina) sprinted home on the throw to second. Wallace found his way across home plate again in the fifth when Cotuit pitcher Justin Grimm (Georgia) balked. Bourne’s Eric Cantrell (George Washington) got out of a jam in the bottom of the fifth on a throw from third to get the last out of the inning before Rico Noel (Coastal Carolina) could cross the plate. He pitched a strong 5-plus innings for Bourne, striking out six and allowing only one run. Bourne put up their last run in the sixth when Stefen Romero (Oregon St.) hit into a double play that still allowed Roller to cross the plate. By then it was clear that the damage was done. 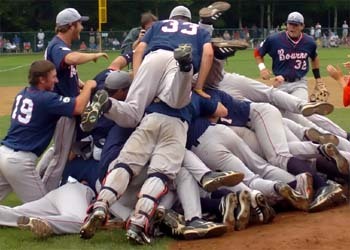 Cotuit couldn’t rally, and the Braves took the game, the series, the title, the trophy. “I just wanted the players to get better, and to get into the playoffs. I didn’t think about championships, really, until we beat Orleans,” said Shapiro. Braves players start the celebration. It’s been a long road for the Braves this season, but early on they showed a considerable amount of power, particularly with Roller swinging the bat. Roller, the MVP of the league and the series, was batting .600 in the post-season going into the final game against Cotuit. His on-base-percentage, .615, outstripped anything Cotuit had to offer. To complement Roller, each of the talented individual Bourne players came together with that chemistry that makes champions. Ben Rowen (Virginia Tech) and Daniel Tillman (Florida Southern) shut Bourne down in the seventh and eighth innings, and Logan Billbrough (William & Mary) and Kevin Munson (James Madison) did the same to Cotuit after Cantrell came out in the sixth. 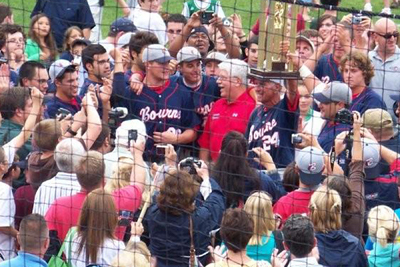 Bourne Braves believe and championship goal achieved. And the players felt as though the win meant something more than even just a championship. 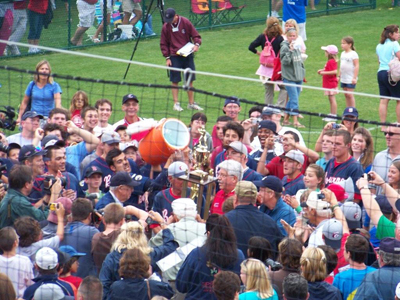 The history of the Cape league, with its town teams and rooted fan base, added a layer to this victory that the players will remember far into their futures as ball players.